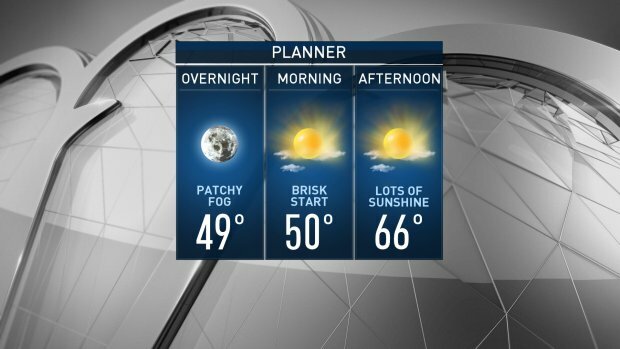 Sunday Night: Mostly clear, patchy fog. Lows in the 40s to near 50. Monday: Mostly sunny. Highs in the 60s to near 70. Tuesday: Mostly sunny. Highs in the 60s to near 70. Skies will remain mostly clear Sunday night, allowing for another chilly morning on Monday. Lows will bottom out in the 30s and 40s in most spots, with a few spots closer to 50 at the coast and in the urban areas. Widespread sunshine during the day allows temperatures to again boost into the 60s for most, with a few spots inland approaching 70. Tuesday will be almost a carbon copy before the jet stream reconfigures on Wednesday. That will allow another surge of warmth to jut into New England. Highs on Wednesday and Thursday will cruise into the 70s and even around 80 for some. All the while, we’ll stay dry until a cold front approaches late Thursday into Friday. That’s our next opportunity for showers. The front will also bring in cooler, more seasonable temperatures for the upcoming Columbus Day Weekend. Right now, the holiday weekend also looks a bit unsettled, with a few opportunities for showers. Foliage, however, will continue to progress this week through all of those changes. Many in Northern New England will be approaching peak foliage, with moderate foliage expanding into parts of Southern New England.